TRUSTEES PRESENT: Julie Cocozza, Sue Federico, Janice Gaswind, Pat Merz, John O’Grady, Rob Richardi, Mary Ryan, Al Sauer, Bette Worth, Helen Young and Bob Young. Guest: Tom DeLorenzo. Mary Ryan opened the meeting at 8:30 am. The minutes of the 1/12/19 meeting were approved via the internet. • Volunteer Day – Bob. We have received concurrence from the Borough to do the following: scrape and repaint the doors at the Brielle Road restrooms, clean the ramp and back stairs at the Life Saving Station, touch-up or repaint all of the hydrants and street markers east of the railroad tracks. There are approximately 75 street markers and 54 hydrants. Kevin Thompson only wants us to paint the white portion of the hydrants. Apparently the tops of some of the hydrants have the wrong color. This makes it much easier and we should be able to pick-up some time. For the street markers each of the 2 people in a group will have a roller. This will also make it go much quicker. We have 25 volunteers for Saturday May 18 plus 2 volunteers who will assist during the week leading up to the 18th to hopefully begin cleaning the street markers and touching up the hydrants east of the creek. We need a final number of volunteers for ordering tee shirts. • Pat – Summer Party Update on Saturday, August 24. Pat received approval for the use of the SBLSS. Al provided Pat with the check for the ABC but it typically takes a lot of time to get the alcohol permit. Bob to provide Mary with list of food, and beverages that we purchased last year. Pat would like to have the team’s first meeting in April. • Julie – MHS Surf Team donation for this year’s Big Sea Day. Our 2018 donation was for $250. Motion to contribute the same amount in May 2019 was carried unanimously. • Bob/John – cost of tables for the First Aid. John is going to check the size of the tables needed. Bob thought the tables sold at Costco are too small. • Bob – Follow-up on summer issues list - Bob followed up with Tom the day of our last meeting (1/12). Tom replied on 1/16 “Hi Bob, I will be back to you shortly on this. Thnx” He has not heard back. The Borough officials may be preoccupied with the budget and COAH issue. Bob to make Tom aware we will incorporate our November meeting in our membership renewal letter going out in early April. • Al –glimmer Glass Bridge. There is a new man working on the project who has prior background in historic preservation activity. Al said progress is painfully slow with all of the red tape. • Mary – Swings as budget item for 2019/MBIA swing set donation. There is a new line item in the 2019 beach budget to maintain playground equipment which was not the case in prior years. Amy Spera told Mary the Borough has submitted an order for replacement swings. In 2013, we collected $5,605 for a swing set which came to $3,811 so we had almost $1,794 which we donated to the Borough toward a second swing set. The mayor told us in 2013 the extra money would be in the following year’s budget for another swing set but it never was purchased. The money went into the restoration fund administered by Wall Cares which desolved last month. They did pay for a tractor repair and AEDs. Mark Kittrick was the treasurer of Wall Cares and Mary has asked Al to follow-up with him. • Mary – Recycle information meeting for the public. Mary contacted the Mayor and Council and was told to contact Greg Love of the Environmental Council. They jointly agreed to host an information meeting for residents on Saturday, April 27 in Borough Hall at 10 a.m. Mary has arranged to have Monmouth County representatives attend. Mary will ask the Coast Star to write a story and put it on the calendar. Sue mentioned the Woman’s Club is doing an Earth Day celebration on Saturday, April 6 from 1 – 4 p.m. with about 15 groups/vendors coming in. One objective is to clarify recycling rules. Frank DiRoma told Mary they are preparing a flier for the realtors to give to renters this summer. • Membership Dues – have been $20. We agreed to maintain the dues amount. • Date for Annual Meeting at the First Aid Building. John will try to book the First Aid Station for 6/8 with a fallback of 6/15. Potential guests include Pip Ertle, Chris Tucker, Mike Bauer, Ed Donovan & Mike Mangan. Sue will oversee refreshments with Janice’s help. • Board nominations /Alex Worth resignation. Alex has moved from Manasquan. Al will store our sound system which Alex currently has in his possession. Tom DeLorenzo expressed a desire to join the Trustees. Tom was voted in unanimously. Bob will look at the expiring terms for load balancing for Cara and Tom prior to the June meeting. Mary offered to let someone else to take over as president but Trustees would like her to continue. • Borough Council report on Sea Watch. The borough hopes to have a public meeting in March on the future of the property. • Derelict buildings. Mary met with Frank DiRoma on several buildings. The Borough has issued summons and the Borough’s hands are tied. • Sea Wall Report/Off-shore drilling. Chris Tucker discussed the Corp of Engineers study in connection with a moveable levee across the Manasquan Inlet to block flood waters. Ed Donovan and Mike Mangan had to attend a number of meetings to get Manasquan included in the study because the Corps didn’t consider Manasquan because of the lack of a back bay. • Helen was contacted about the school election on Tuesday. She brought up that we might want to send out a message to remind members of the vote. Pat mentioned an effort was undertaken to move elections to November. Julie believes it was to move elections but not special issues such as this referendum. We opted not to send out a message since we have updated our members on the new polling places. • Inlet Mural – Helen ordered a plaque from Keifer in Wall this week. It should be available before Memorial Day. • Water Meter Leak Detection Notification - The link sent out by the Borough does not work. Bob will notify Jeff Lee who oversees DPW for the Borough Council. • Private Flood Insurance – Tom asked if anyone had taken it and if it is above the maximum of $250k. Rob and Al confirmed it was above the limit. 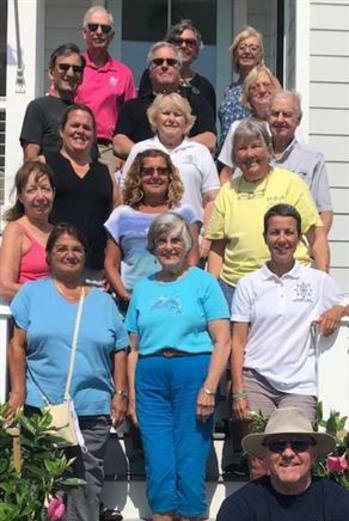 The next Trustee’s Meeting will be on May 11 at 8:30 a.m. at the Squan Beach Life Saving Station. Public Recycling Meeting on Saturday, April 27 starting at 10 a.m. at Borough Hall. - Studies show bridge falling apart and MUST be replaced; Childs independent? study; Cycle 14 draft report. - HISTORIC REGISTRY DOES NOT MEAN BRIDGE CAN'T BE REPLACED. - Originally built as a wooden trestle bridge (without a draw) over 100 years ago before cars; 16 feet wide, 585 feet long. - Draw span (20 feet wide) built over 100 years ago for spanning Pt. Pleasant Canal (before cars). 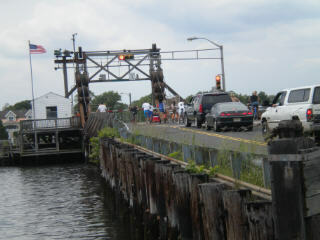 - Draw span installed in wooden trestle in 1938; originally hand operated. 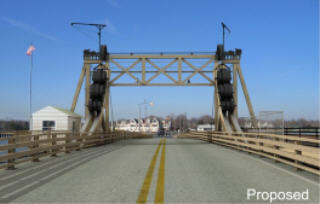 - Completely rebuilt in 1950; entire bridge raised 5 feet; shortened to 279 feet; motorized; more counterweights added. - Placed on State and Federal Historic Registers in 2008. - Historic significance is technology (rolling counterweight design) and aesthetics being preserved by County compromise. - Bridge is in such bad condition, none of the structure can be salvaged; all piles, supports, bridge deck will be thrown away. 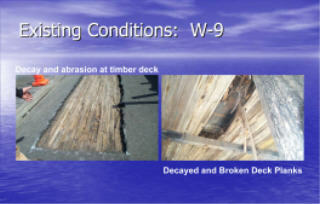 - Estimated life of a new wooden bridge is 35-50 years; estimated life of the proposed bridge is 75 years. - County traffic count July 9-15, 2007: 6,480 average daily vehicles; 5,905 average weekday vehicles; 7,726 average weekend vehicles. 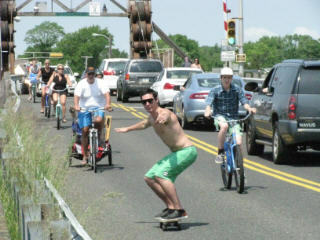 - MBIA traffic count May 26, 2012 8:00 a.m. 6:00 p.m.: 4,138 vehicles; 688 bicycles; 21 skateboards; 372 pedestrians; traffic stopped 4:24 hours; open 5:36 hours; 10:00 a.m. 4:00 p.m., traffic stopped 3:30 hours; open 2:30 hours. - Road is almost becoming impassable in summer due to opening/closing taking so long; long lines of cars. - Safety is most important issue for vehicles, pedestrians and bicyclists. Complete Streets. - Current standards: two 12 foot width lanes; two 4 foot wide shoulders. - Main access for residents living south of Brielle Road and for Brielle and Point Pleasant emergency response. - The County has been working out a plan for the bridge since the early 1990 Asbury Park Press, 8-17-07. - Project authorized 4-14-94 for $1,000,000.00; studies to date over $700,000.00. - Wooden bridge would have CCA and AZCA (arsenic). 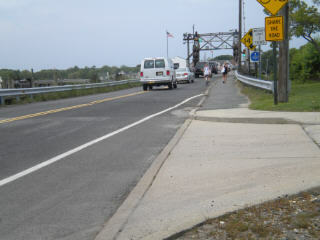 - Brielle Resolution 8-18-03 (#111-03) and Manasquan Resolution 9-8-03 (#03-70-A) call for complete replacement of bridge. - Issues of public safety should be treated as paramount to other considerations. - No more delays; we must act NOW. 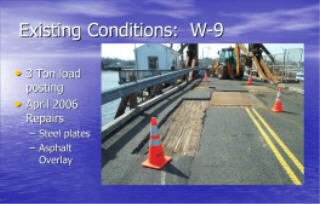 Mary was previously given surveys by Tom Flarity of the properties on both sides of the North Beach Ramp. Upon review of them, they were not in agreement as to the location of the improvements along and on the 4 foot ramp. However, actual measurements between improvements on each side of the ramp indicated that the useable area was mostly 42 inches but in some places as narrow as 38 inches. Consequently we were asked to set-up a meeting with Tom Flarity and to try to get the Borough to order its own survey to determine who was encroaching on the 4 foot width and by how much. Bob Young and I attended a meeting on September 7, 2018 with Tom Flarity, Councilman Jim Walsh, and Frank DeRomo from the Building Department. We were surprised to see that the Borough had done a survey of the ramp property in 2017. In addition to the 4 foot width of the Borough property for the ramp, in 1968 the Borough was granted an easement by the owner of the property on the north side of the ramp to build an 8 inch wide masonry wall on that owner’s property. Therefore, we had always assumed that the wall was properly located and that would meant that the owner on the south was the one that was encroaching into the easement. However, this survey showed that most of the wall was built within the 4 foot ramp area and not where it was supposed to have been built. Therefore, when the owner on the south fenced in his property, his fence was put mostly on his own property. The survey did show that the fence, at one point, encroaches at most .13 of a foot (which is about an inch and a half) into the ramp area. Consequently, there is no gripe as to the owner on the south. This was pointed out to the Borough in 2017 by the attorney for the owner on the north. The attorney also pointed out that it was the Borough’s obligation to maintain that wall but that the Borough had not done so since it has many cracks and deficiencies in it. The Borough advised that once they were aware of this and of what sort of cost the Borough would have to expend in order to remove and replace the wall in its proper location, they did not feel it was economically feasible for them to take any further action. The Borough’s 2017 survey was too large for them to make a copy for us at the meeting. However, they did agree to send it out for copying and would send us a copy of it. We did point out that the painted crosswalk at the corner of Stockton Lake Boulevard and First Avenue goes directly across the street at right angles to First Avenue and ends up misleading pedestrians that this is the place where the public ramp is located. In fact, the public ramp is several doors to the south. While MBIA has previously requested the Borough on several occasions to relocate the painted crosswalk, the Borough has never done anything about it. However, this time they agreed that they should either angle the crosswalk from the corner to the public ramp or move the crosswalk south so that it goes from the west side of First Avenue directly to the public ramp.